HUNTSVILLE, AL, October 13, 2016 – The North Alabama International Trade Association (NAITA) announces results of the 2016 North Alabama International Trade Study. Please click here for the 2016 North Alabama International Trade Study Overview. The study was conducted for NAITA by the University of Alabama in Huntsville (UAH) Center for Management & Economic Research. 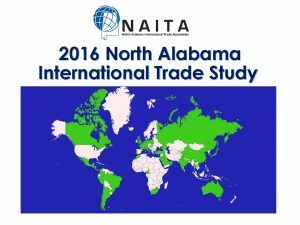 NAITA was cited by North Alabama companies as their most used international trade assistance resource. The study gives a comprehensive view of International Trade and Export development and trends by companies in the North Alabama region, which includes the Huntsville, Decatur and Florence-Muscle Shoals Metropolitan Statistical Areas (MSAs). North Alabama companies were responsible for at least $2.3 billion of product exports to international markets in 2015. This continues an upward trend for the total value of exported goods by North Alabama since 2011. Companies who participated in the study have optimistic expectations about their export opportunities, as 93 percent believe that their 2016 exports will exceed those from 2015. Computers and Electronic Products, Transportation Equipment, Machinery Manufacturing, Chemical Manufacturing, Primary Metals Manufacturing, and Agriculture and Food Manufacturing remain the top product export sectors for North Alabama, as they have for the last five years. Trends for Transportation Equipment, Computers and Electronics, and Chemical sectors are continuing upward. Primary Metals, and Agriculture and Food sectors had a flat trend with no change, and Machinery Manufacturing is the only sector to experience a slight downward trend in the last five years. Top destinations for exported products by North Alabama companies yielded 50 countries. Canada was the top destination for 46 percent of companies, followed by China (37 percent), Mexico (37 percent), Japan (28 percent) and Australia (26 percent) rounding out the top five for international export destinations.